The NewsHour has confirmed that Sylvia Burwell, Director of the White House Office of Management and Budget, will be tapped to replace Kathleen Sebelius. 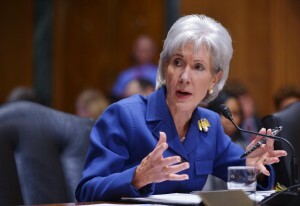 Health and Human Services Secretary Kathleen Sebelius is resigning from the Obama administration after the rocky rollout of President Barack Obama’s signature health care law, a White House official said Thursday. Her resignation comes just one week after the end of the first enrollment period for the Obamacare law. While the opening weeks of the rollout were marred by website woes, the administration rebounded strongly by enrolling more than 7 million people in the new insurance marketplaces. The official said Obama was nominating Sylvia Mathews Burwell, the director of the Office of Management and Budget, to replace Sebelius. The official was not authorized to discuss Sebelius’ resignation ahead of the formal announcement and requested anonymity. The next secretary will have to with contend with huge challenges related to the continued implementation of the health overhaul, as well as the divisive politics around it that show no sign of abating. On the practical side, the administration has to improve customer service for millions of Americans trying to navigate the new system. There’s also a concern that premiums may rise for 2015, since many younger, healthier people appear to have sat out open enrollment season.